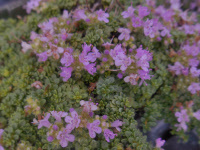 View cart “Thymus pseudolanuginosus Woolly thyme Z 4-8” has been added to your cart. Bright mauve flowers dance on wiry stems in afternoons all summer, closing at night. Leaves are succulent. Collected by Dr. Frederick Wislizenus, German immigrant and medical partner of George Engelmann, on an exploring trip of Texas, New Mexico and Mexico in 1846. Airy sprays of palest of pink flowers in early summer & sporadically reblooming. Pretty foliage – flushed with purple and marbled grey, think Begonia leaves. Described in literature 1888. Collected for the West by Augustine Henry (1857-1930) Irishman who went to China as a physician in the Imperial Maritime Customs Service and stayed 20 years hunting the plants of central China. He collected about 5000 new plants. Used in traditional Chinese medicine. The species name ichangense comes from the province of Ichang where Dr. Henry found this. miniature, very hairy silver leaves, resembling wool. Lavender flowers in June. 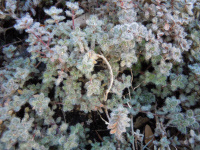 Grown as a groundcover or in rock gardens for its miniature, very hairy silver leaves, resembling wool. Lavender flowers in June. 1st mentioned in literature by Phillip Miller of Chelsea Physic Garden, 1771. 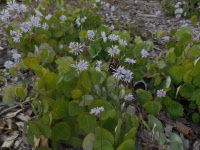 Miniscule gray-green leaves, topped by tiny pink flowers in midsummer, spreads to form a tight carpet. 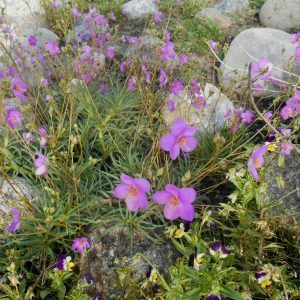 Size: Great for rock gardens, groundcover, drought tolerant. Thymus from the Greek word for “odor” due to the plant’s fragrance. Ancient Greeks made incense with thyme. ‘Minus’ described by Parkinson in 1640. He called it Thymus serphyllum vulgare minus.